In October, the Finlandia Prize for Architecture will be awarded for the fifth time. 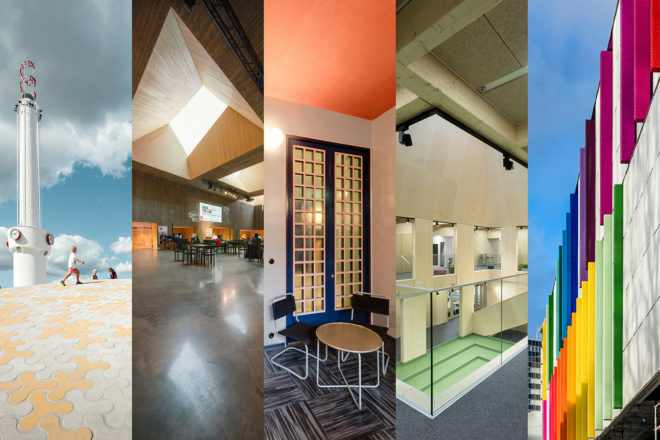 This year the finalists are Amos Rex Art Museum, Lallukka Artists’ Home, Helsinki University Think Corner, Tuupala Timber School and the New Children’s Hospital. The winner will be selected by forensic orthodontist Helena Ranta. The members of the pre-selection jury, appointed by the Finnish Association of Architects SAFA, were professor Hannu Huttunen, architect Janne Teräsvirta, doctor of technology Anne Stenros and architect Juulia Mikkola. Secretary General of SAFA Paula Huotelin acted as secretary of the jury. Two of the finalists, Amos Rex Art Museum and Think Corner, are designed by JKMM Architects. Located under the Lasipalatsi Square, Amos Rex opened to the public in August 2018. The domes of the museum protrude through the square surface creating an interesting urban topography. The square and its mounds have already been adopted by the city dwellers. Think Corner, facing the Helsinki University Main Building and the Porthania Building on the other side, is a meeting place for students, teachers, entrepreneurs and citizens. The university’s old administrative building, originally completed in 1977, was transformed into a new urban space open for all. The chief architect in both JKMM projects was Asmo Jaksi. The project architects for Amos Rex were Freja Ståhlberg-Aalto and Katja Savolainen while Päivi Meuronen was in charge of the interior design. The project architect of Think Corner was Teemu Toivio. The renovation of the listed Lallukka Artists’ Home was designed by Freese Architects. The Functionalistic residential and studio building by architect Gösta Juslen and completed in 1933 is still in its original use. The architects in charge of the renovation works completed last year were Simo Freese, Eva Knif and Anu Halme, and of the restorative coloring scheme for the common spaces professor Vilhelm Helander. 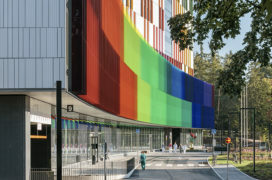 The New Children’s Hospital for the Hospital District of Helsinki and Uusimaa will open in September. The design of the new building, unlike traditional hospital design, focuses on the comfort and convenience of the young patients and their parents. The responsibility of designing the extensive project was shared between Antti-Matti Siikala, Sarlotta Narjus and Sakari Forsman of SARC Architects and Susanna Kalkkinen of Architect Group Reino Koivula. The only finalist located outside the capital city is Tuupala Timber School in Kuhmo, completed this year. The primary school and daycare centre building is a composition of cube-shaped, wood-clad masses and outbuildings. The timber-structure school was designed by Antti Karsikas, Ville-Pekka Ikola, Tuomas Niemelä and Kalle Vahtera of Alt Architects together with Martti Karsikas. According to the Finlandia Prize for Architecture rules, every year a public figure from a field other than architecture is invited to select the winner. Forensic orthodontist Helena Ranta has served as an international expert in several conflict and disaster areas and investigated human rights violations in areas such as the Balkans, Chechnya and Iraq. In addition, she has worked for human rights and women’s rights in a variety of NGO’s. “Choosing the Finlandia Prize winner is a very interesting task. I travel a lot and, whenever possible, I take time to visit architectural sites. For example, in the Balkans there’s a lot of Art Nouveau architecture. This year’s candidates share little commensurability, which makes the selection all the more challenging,” Dr Ranta points out. The winner will be announced on the World Architecture Day, 1st of October. See all Finlandia buildings here.